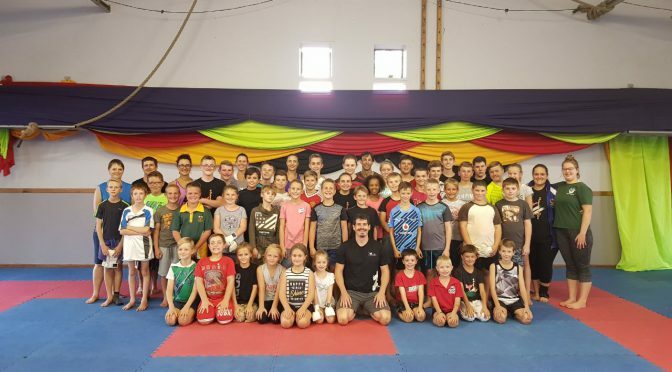 Solis Ortus is in the process preparing for the SA JKA Nationals, 25th and 26th May 2018. Frequent practice during the past 4 weeks leading up to the event, greatly improved our karatekas’ abilities, form, skills, and confidence. SA JKA karatekas will march up from all corners of South Africa to represent their Province. This week it will be our last training session as a dojo team to go out and represent our Province at Nationals. Our karatekas revealed defined character practising every week improving themselves for the greatest upcoming event; SA JKA Nationals. Remember what you have practiced over the past weeks and especially what sensei has taught us. Stay focussed and calm, but with determination. Remember, when performing your kata, you need to demonstrate good technique, good stances and rhythm. Don’t rush to finish, show the judges you have good form and resonance in you kata. Slow is slow, and fast is fast. Kiai loudly. Good technique is also required in kumite when trying to score against your opponent. Initiating the attack allows you to take control of the fight and is intimidating to your opponent. Take control and keep it. Also have a good guard. Don’t leave yourself open. Correct distancing enables you to attack your opponent, but also allows you to be just out of range of your opponent’s attacks. Thank you to sensei Eugene who invested in us his time, knowledge and methodology in becoming a winner. Thank you to our parents believing in our karatekas, who consistently bring them every Friday afternoon to practice; and supporting our Solis Ortus Team preparing for the big day. Thank you to our students who persevered through the training, who gave their all to improve themselves, who sweat together and encouraged each other, and above all, who believed in themselves. Sensei Eugene feel honoured to be able to have such a positive and stable club; and in reverse, us as karatekas are honoured to learn from the best. You are ready, go out and do your best, never give up. Always push yourself a little further. If you keep going – you always have a chance to win. So, we have come this far…preparation, done…prepared, YES! On your marks, get set….GO!!! !